Obamacare opponents have already run more than 30,000 television ads attacking the health law and Democratic candidates who support it, according to the media tracking group CMAG — a staggering 12-fold increase from four years ago. Many of the ads are being run in states with high uninsurance rates where hundreds of thousands of poor people could benefit from the Affordable Care Act, including Arkansas, Kentucky, and Louisiana. 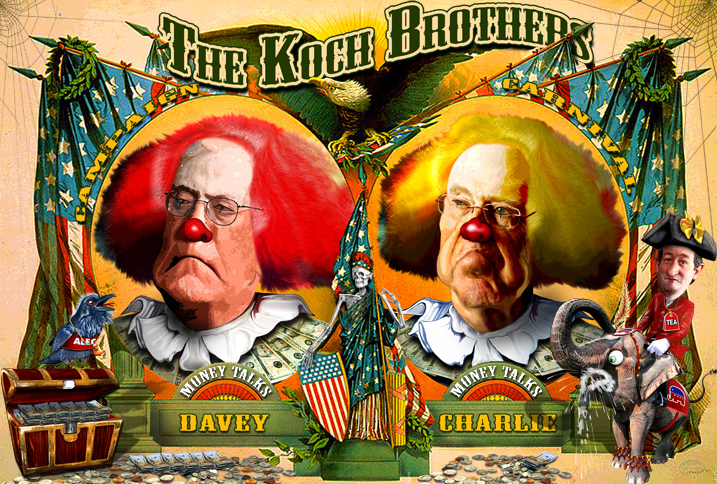 DonkeyHotey: The Koch Brothers Campaign Carnaval | Flickr – Photo Sharing. Fifty-one percent of Americans favor retaining the Affordable Care Act with “small modifications,” while 13 percent would leave the law intact and 34 percent would repeal it. That’s the highest level of public acceptance for the law yet in the Bloomberg poll. By the way, do you know who benefits from all this early campaign ad spending? The cable companies and television networks. They are on their way to record advertising revenue from political ads this year. If you believe this does not affect the content of news coverage, I have a bridge in New Jersey I’d like to sell you.